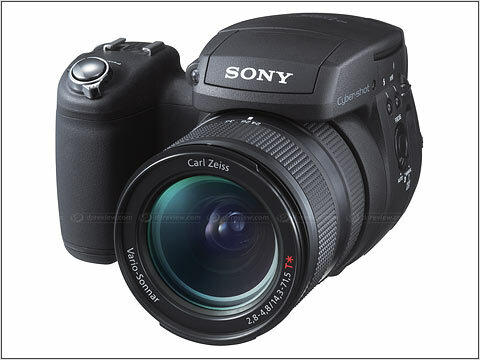 SAN DIEGO, Sept. 8, 2005 – Sony intends to create a new benchmark in digital photography with the introduction of its high-end Cyber-shot® DSC-R1 camera. The Cyber-shot® R1 camera is the world’s first integrated lens digital still camera to combine a professional-grade, 10.3-megapixel image sensor and the flexibility of live preview while shooting. With its ultra-wide Carl Zeiss Vario-Sonnar T* zoom lens (24mm – 120mm) and free-angle, two-inch LCD, the Cyber-shot R1 brings professional level imaging performance to mainstream consumers. Photo enthusiasts know that image sensor size is one of the most important influences on picture quality. Professional-grade image sensors, sometimes referred to as advanced photo system (APS) or APS-class, are many times the size of compact sensors used in point-and-shoot cameras; large sensors deliver extraordinary resolution, high sensitivity to light, and lower image noise or graininess for exceptional pictures. At 10.3 megapixels, the R1’s sensor offers one of the highest resolutions available in the APS class. Unlike digital SLRs, the Cyber-shot R1 unit’s sensor allows for a “live” preview thanks to Sony Complementary Metal Oxide Semiconductor (CMOS) technology. Until now, the extraordinary power consumption of these large sensors has limited their operation to image capture only – unable to support the benefit of a live preview. Sony’s distinctive design is employed to reduce power consumption, as well as increase image processing speeds. The camera’s electronic viewfinder or two-inch LCD lets you evaluate scene conditions, such as exposure and how color is rendered before taking a shot. Because the R1 camera can preview electronically, using the image sensor itself in real-time, framing is always 100% accurate. The R1’s integrated Carl Zeiss Vario-Sonnar lens was carefully crafted to take full advantage of the resolution, clarity and color performance of its APS-class CMOS image sensor. Because of the sensor’s live preview capability, there is no need for the camera to have a traditional “mirror and prism” construction common to digital SLRs. This allows a lens-to-sensor distance of as little as 2 mm, optimizing image quality and color accuracy. Another benefit of this structure is the ability to incorporate an extraordinary wide field of view and zoom range. The 24 mm wide end of the lens is particularly suited for architectural photography, landscapes and large-group portraits, while the 120 mm telephoto end is perfect for filling the frame with distant subjects. This is a range not easily matched by any other lens for use with cameras using large-scale image sensors. Furthermore, no mirror and prism construction means that the R1 is a quiet camera, perfect for shooting at a tennis match or in nature without disturbing wildlife. The Cyber-shot R1 sports a two-inch, LCD screen that folds flat and swivels so you can shoot from nearly any position. This flexibility allows you to get the shots that other cameras miss. For example, you can hold the camera low – down to the ground – for eye-level view shots of kids and pets without having to bend yourself into a pretzel or crawling on the ground. A 10.3-megapixel camera needs a fast processor. Sony harnessed the power of it Real Imaging Processor™ LSI to achieve fast response times, low power consumption and clear images. The new camera features a one-second shot-to-shot time, three frame-per-second burst shooting, and a shutter release time of only 7.5 milliseconds. Because it consumes 70 percent less power than Sony’s previous processing circuitry, the camera has a battery life of up to 500 shots per charge, which can vary according to use and camera settings. For enhanced versatility, Cyber-shot R1 offers three different modes of color reproduction: Adobe RGB used for professional graphics and offset color printing, Standard sRGB for most computer-based uses, and Vivid sRGB for more intense primary colors. The camera’s user selectable Advanced Gradation Control System (AGCS) optimizes image contrast, in order to avoid “blown out” highlights in high-contrast scenes and “crushed” blacks in low-contrast ones. AGCS evaluates the distribution of brightness and then automatically applies the appropriate gamma curve to achieve better pictures. Users will also enjoy the added convenience of storing images onto Memory Stick PRO™ media, as well as CompactFlash® Type I and Type II media or Microdrive® media. The camera supports both JPEG and RAW formats, which can then be manipulated on a PC using the supplied Sony Image Data Converter SR software. The Cyber-shot R1 camera will be available in mid-November for about $1,000 online at SonyStyle.com, at Sony Style retail stores (www.sonystyle.com/retail), and at select authorized dealers nationwide. Pre-orders begin online today at http://www.sony.com/r1. The new camera is supplied with a NP-FM50 InfoLithium battery, an AC-L15 adaptor, a USB and video cables, shoulder strap, and CD-ROM software with PicturePackage and Image Data Converter SR for RAW. There are a variety of optional accessories (sold separately), including wide angle and telephoto conversion lenses, adaptors, filters, tripods, flashes, carry cases, a neck strap and a battery.